The competition is getting harder between the operative systems for the mobile phones… We have earlier written that Jolla will compete against Apple, Android and Microsoft. BUt they are not alone any more. Check who is going to give Android even more competition! 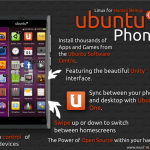 We have good news for all people that think more competition is good for the mobile market: The popular Linux distrbution Ubuntu will come to the mobile platform within the next 12 months! The Ubuntu developers may have been inspired by Windows Phone since you can swipe the screen entirely from the left to right to switch between media, applications and contacts. If you swipe from the top you will get the search screen, and from right will give you the apps. Since it comes without use of Java, they promise a more powerful and reliable operative system, and it will be a completely open OS. Check out the video below. .